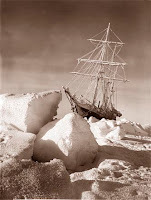 In 1914, Sir Ernest Shackleton set out from England on a daring expedition. His goal: the first crossing of the Antarctic continent.Sir Ernest Henry Shackleton was an Anglo-Irish explorer, knighted for the achievements of the "British Antarctic Expedition" (1907 - 09) under his command, but now chiefly remembered for his Antarctic expedition of 1914–1916 in the ship Endurance.The Endurance battled her way through a thousand miles of pack ice over a six week period and was one hundred miles - one days sail - from her destination, when on the 18th of January 1915 at 76°34'S, the ice closed in around her.By the end of February, temperatures had fallen and were regularly -20°C, the ship was now clearly frozen in for the winter.Everyone knew that one of two things would happen, either the pack ice would thaw, break up and disperse in the spring, so freeing the ship, or it would consolidate and driven by the effects of wind and tide over hundreds of miles of sea would take hold of and crush the ship - like a toy in a vice.After five months of camping on drifting ice floes, open water appeared, and the men sailed their three lifeboats through stormy seas to a rocky, uninhabited outcropping called Ele phant Island. Knowing that his men would never survive on the desolate spot, "the boss" Shackleton decided to attempt an incredible seventeen-day, 800-mile journey, in freezing hurricane conditions, to the nearest civilization - South Georgia Island. The James Caird lifeboat miraculously landed on the island, having achieved what is now considered one of the greatest boat journeys in history. Once on land, Shackleton and two of his men trekked across the mountains of South Georgia, finally reaching the island's remote whaling stations where they organized a rescue team, and returned to save all of the men left behind on Elephant Island. Sławomir Rawicz (1915 – 2004) was a Polish soldier who was arrested by Soviet occupation troops after th e German-Soviet invasion of Poland. By Rawicz's account, when the Soviet Union and Germany took over Poland, Rawicz returned to Pińsk where NKVD arrested him on November 19, 1939. He was taken to Moscow. He was first sent to Kharkov for interrogation, and then after trial he was sent to the Lubyanka prison in Moscow though these details after his arrest have not been validated from soviet sources. He claims to have successfully resisted all attempts to torture a confession out of him in prison. He was sentenced, ostensibly for spying, to 25 years of hard labor in a Siberian prison camp. Soviet records discovered in 2006 conflict with his account. The record verify that Rawicz was a Polish soldier but differ on the details of why he was arrested and the camps/prisons in the USSR he was held in.According to his later account, Rawicz received unexpected help from the wife of the camp commander, Ushakov, when he was asked to look at their radio set. She arranged additional supplies for him and his allies; in return she wished that they'd escape when her husband was absent. Rawicz befriended six men: Polish border guard Zygmunt Makowski; toothless Polish cavalryman Anton Paluchowicz; huge Latvian Anastazi Kolemenos; Eugene Zaro; Lithuanian Zacharius Marchikovas; and a US engineer who said his name was Smith.On 9 April 1941, Rawicz claimed that he and his six allies escaped in a middle of a blizzard. They rushed to the south, avoiding towns in fear they would be betrayed, but apparently they were not actively pursued. They also met an additional fugitive, Polish woman Krystyna. Nine days later they crossed the Lena River. They walked around Lake Baikal and crossed to Mongolia. Fortunately, people they encountered were friendly and hospitable. During the crossing of the Gobi desert, Krystyna and Makowski died. Others had to eat snakes to survive. Around Oc tober 1941 they claim to have reached Tibet. Locals were friendly, especially when men said they were trying to reach Lhasa. They crossed the Himalayas somehow in the middle of winter. Marchinkovas died in his sleep in the cold. Paluchowicz fell into a crevasse and disappeared.Rawicz claims the survivors reached India around March 1942, but the date is very much open to speculation. The party claims to have met a patrol of soldiers who have been later thought to be gurkhas but may have been soldiers of the Assam Rifles or even soldiers from the army of Nepal. Yates and Simpson were the first people to ascend to the summit of Siula Grande via the almost vertical west face. Disaster struck, however, on the descent. Simpson slipped down an ice cliff and landed awkwardly, smashing his tibia into his knee joint and breaking it. The pair, whose trip had already taken longer than they intended due to bad weather on the ascent, had run out of water and gas (which could have been used to melt ice and snow) and needed to descend quickly to their base camp, about 3,000 feet below. They proceeded by tying two one hundred and fifty foot long ropes together and then tying themselves to each end. Yates dug himself into a hole in the snow and lowered Simpson down the mountain on the 300 feet of rope. A second disaster struck however when Simpson was lowered over a 100 foot overhanging cliff and left dangling in mid-air. Yates could not see Simpso n, but felt all his weight on the rope, very slowly pulling Yates down the mountain. He held on for about an hour but was eventually forced to cut the rope, dropping Simpson into a crevasse. The next morning Yates descended the mountain alone, and found the cliff. He realised what must have happened to Simpson and to his horror saw the crevasse below. He was certain that Simpson must have died in the crevasse and descended the rest of the mountain alone, which is itself a dangerous feat. In fact, Simpson had survived, despite a 100 foot fall and broken leg. When he took in the rope, he discovered the end was cut. He eventually abseiled from his landing spot on an ice bridge (which broke his fall and therefore presumably saved his life) to the bottom of the creva sse, and crawled out back onto the glacier via a side opening. From there, he spent three days, without food and only splashes of water from melting ice, crawling and hopping five miles back to the base camp. Almost completely delusional, he reached the base camp a few hours before Yates intended to leave the camp to return to civilization. In 1981, Steven Callahan was a crusty young man from Maine with adventure in his heart.In the fall of 1981, he realized his dream and sailed his own design 21 foot sailboat across the Atlantic from Newport to Bermuda, then on to England. His return from England would be with a race called the Mini-Transat and would complete a circumnavigation of the treac herous Atlantic by returning him to Antigua in the West Indies. At least, that was the plan. Little did he know how bad his plans would turn on the trip back west. For the actual Mini-Transat leg, Steven went it alone and met up with problems of rough weather and a pierced hull off the coast of Spain that nearly sank the boat. He managed to plug the hole and limp to port where he made repairs but the race was over for him. Eventually he got back out to sea to try completing his crossing without the race and brought on a young woman to crew who he met while in port. She left him on the island of Madeira and the transatlantic solo journey started in earnest. From the Canaries to the Antilles is over 3,000 miles of open ocean. His timing could have been better as this was now late January 1982 in the unpredictable North Atlantic. Steven encountered storms, huge waves, high winds. His tough little boat seemed up to the task until one day early in February the boat collided with something, maybe a whale? maybe just a huge rogue wave? No way to tell but the boat was taking on water rapidly and Steven had to fight for his life to get out, inflate his rubber lifeboat under crashing seas, and desperately try to salvage whatever survival gear he could from his sinking boat. The next 76 days were truly an incredible tale of resourcefulness and grim determination against all odds. I couldn't have imagined what it must have been like to be stranded in a turbulent sea for that kind of time period. Steven's account gives you a good idea of the hardship and immense difficulty he endured. Steven's emergency raft was rated a 6 man inflatable, large for such a task but still a small cramped space. He had very little food and water, only a few simp le tools, a rubber band powered spear gun, a few flimsy plastic inflatable solar water stills, but the courage and resourcefulness of a Cro-Magnon to make do with so little. He battled rogue waves, failing water stills, shark attacks, continual deperate hunger and thirst, and loneliness for what seemed an endless period. 9 ships passed by over the months and missed or ignored seeing his flares or hearing his radio distress calls. His boat attracted aggressive Dorado and Triggerfish who he eventually learned to catch with rudimentary tools. The powerful fish nearly destroyed his craft time after time. He nearly lost the craft to punctures.